Money talks. Our bodies talk. And, so do our homes. If fact, our team here at Brock Doors & Windows have learned through experience that structures communicate with their owners if the owner is in-tune. We want you to know just what to look for in your Toronto window replacement considerations. Have you become used to drafty windows or have you recently noticed drafts as the temperatures drop outside? Walk around and take note of any temperature changes you feel. The best time to check is in the morning when temperatures outside are lowest. Over time, old frames can become warped from exposure to the elements or poor maintenance (or poor installation/cheap materials). This can create gaps in the structure, allowing for air to seep through. A drafty window is not a charming nuance—it is a sign from your home that a window replacement is needed. This should be obvious, but you would be surprised how many of us grow accustomed to what we think is a small inconvenience. Listen, if you cannot open or close your windows with ease, your home is telling you: “replace these windows!” Rot or rust could be the culprit—both are significant issues. For homeowners with single- or double-hung windows, this issue should demand immediate attention, as this affects balance within the structure. In simpler terms, a “sticky” window can quickly turn into a “slammed” window, which poses a safety risk for your loved ones. Here’s where money and homes both Take to the Internet and research what a home in your area, with similar square footage, should require(on average)in utility costs. Here in Toronto, we expect to pay to stay warm! But, there is a limit and it is important you know whether your current windows are robbing you or supporting you financially from month to month. An easy tell: your energy bill is noticeably higher than in previous years. If your home has double- or triple-paned windows and you find condensation, it is time to replace. There is no way around this—windows should not do this. There is no shame in admitting you and your home have outgrown your old windows. You should love your home and your windows should love you back by providing charm and meeting your aesthetic goals. Is your home giving you any of these warnings? 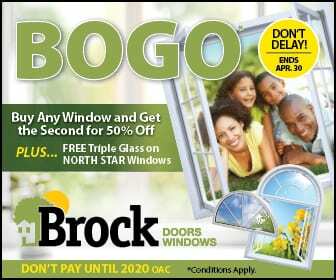 Give our team at Brock Doors & Windows a call. Let’s respond to your window replacement needs together!